On Sunday, September 29th at Deep Roots Music Festival’s Closing Concert, Barbara Hansen received the 2013 Valley Arts Award. 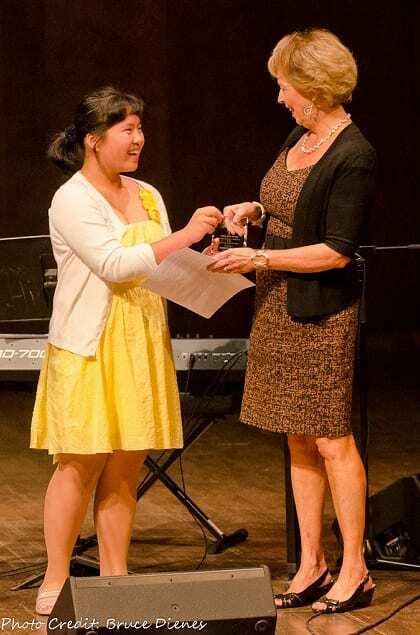 The award was presented by 13 year old pianist, Chantal Peng, who performed the Maple Leaf Rag and also explained why she nominated her teacher. “Mrs. Hansen is a great teacher shown through her ideas, dedication, love for the instrument, encouragement and motivation. Mrs. Hansen is extraordinarily dedicated, patient and full of love, all combined with a great fashion sense. You feel super excited to go to your lessons! Ms Hansen was proud to say that a number of her students were able to attend the presentation, and others sent tributes. It was a thrill to hear that my former teacher, Barbara Hansen, is this year’s recipient of the Deep Roots Arts Award. This award is given to someone who has “made a significant contribution to the Arts in the Valley”. I firmly believe there is no one within this community of musicians and teachers that better embodies this definition than Barbara! I was fortunate to study with Mrs. Hansen from the age of 8 until I was 18 years old. These were formative years for me as a musician and a person. A decade as Barbara’s student taught me a lot! In fact, when I was first hired at Acadia one of my graduating students asked me what was the most important thing I had done to become a better musician. I replied honestly “piano lessons with Barbara Hansen”. Of course she taught me how to play, but she also taught me patience, diligence, self-awareness, confidence and determination. I needed all these skills to pursue my studies and continue my professional career. Mrs. Hansen is a demanding presence and a spirit teacher. She is an energetic and passionate musician. Barbara is a thoughtful and loving mentor. She is also the best-dressed woman around! As a young child I was constantly chastising my mother for not dressing more like Mrs. Hansen. She truly was the hippest woman on the block and I aspired to be just like her! I am pleased to call Mrs. Hansen my teacher, but even more honored to call Barbara my friend. She and I have found this wonderful new balance of friendship, family, love and respect. It is very rare to find this with a former teacher and I treasure this new stage in our relationship. Congratulations to Barbara! A well-deserved honor indeed! Mrs. Hansen has had a tremendous influence in my musical life. What a treasure it was to learn such a healthy and beautiful technique in my early years. Her natural sense of artistry was balanced with a stylistic integrity, and she imbued this into her students’ performances. Looking back on her teaching style, I can see how her methods were extremely effective! Instinctually, she applied many of the pedagogical techniques that researchers have shown to be the most successful. But best of all, lessons were outrageously fun. She ultimately inspired me to study music in university, imparting her sense of passion and respect for the music. If I could, I would do it all over again. Barbara Hansen has a reputation locally and across Canada as a piano teacher of the highest standard. She is demanding and determined as she takes the raw material of a student and works week by week to draw out new heights of musicianship from them. But Barbara balances out her pursuit of excellence with her charming wit and her warm, nurturing concern. She is one of a kind. Anyone who has studied with Barbara will remember the importance of arm circles, thinking to the end of a phrase, and practicing running passages in rhythms. Oh, yes, and numbering the sections of a piece and memorizing from the beginning of each one. She can take a student who wants to work hard and turn them into an artist. It was a privilege to study with Barbara, and I am thrilled now that she is teaching my daughter. Mrs. Hansen is extraordinarily dedicated, patient and full of love, all combined with a great fashion sense. You feel super excited to go to your lessons! Mrs. Hansen is a great teacher shown through her ideas, dedication, love for the instrument, encouragement and motivation. Mrs. Hansen is pretty: she walks like a fashion model, dresses up like a movie star, talks like a TV host. You feel super excited to go to your lessons! Mrs. Hansen encourages you to step out of your shell – letting you compete at the local level, provincial, even the nationals! Mrs. Hansen is the greatest teacher ever! Mrs. Hansen is a true artist! Barbara Hansen gave me all the tools I need to succeed. She gave me patience, proper technique, the value of slow practice, the ability to express myself properly at the piano and the connections I need to advance my musical career. And when all else failed, she believed in me. I will be forever thankful for all that she has done for me. Barbara has been an integral part of my growth and success as a musician. From a very young age, she taught me how to develop good habits, a strong work ethic, and an attention to detail. More importantly, she made music fun, and I will never forget the many good memories and experiences we shared together. I also credit Barb with introducing me to and preparing me for music competitions at the National level. Her continuous support in her current and past students’ endeavours speaks volumes about her character and about how much she cares about her students’ success. It is without a doubt that Barbara deserves this award, and I wish her all the best. Home Slice, a song written by students of Horton High School, Keith Mullins, and Heather Kelday during the 2013 Deep Roots Festival. The Deep Roots Late Night shows are particularly lively and usually sell out early. Musician David Carmichael, who has booked the acts for this year’s Festival, is excited about the wonderful collaborations in the making. Both nights are going to be rockin’. “Cajun Heat,” a licensed dance party, happens at the Rafter’s Heritage Barn, Old Orchard Inn, Friday Sept. 27, starting 10:30 pm. Unisson, a great young Acadian band from Clare; David Greely, with his Cajun/Irish roots from Louisiana, and his more than 40 year love affair with the fiddle on stages all over the world; and Montreal-based Cajun/Zydeco band, Grouyan Gombo, with their savory gumbo of southern and northern traditions, will ensure temperatures rise on and off the dance floor. Georgette LeBlanc, writer-dancer-actor-author from Baie-Ste-Marie, will emcee this wonderful Cajun/Acadian collaboration. Saturday night, again at 10:30pm, at the Rafter’s Heritage Barn, Old Orchard Inn, “Blues in the Night,” brings Ray Bonneville, with his deep-grooving blues style and bring-down-the-house performance reputation; and one of the most original and exciting young bands on the scene today, The 24th Street Wailers, together for what will be another memorable night of entertainment and dancing. And just in case you need a little incentive … volunteer at this year’s Festival, and tickets to these two events are half price (only $10 per ticket and up to a maximum of four tickets per volunteer). Buy Tickets Soon as the Deep Roots Late Night shows are particularly lively and usually sell out early. The Deep Roots Music Cooperative welcomes your help in the presentation of the Deep Roots Music Festival. The Festival volunteer program offers opportunities to extend a helping hand in one or more areas that require reliable and committed community support. Click Here for more information and a Volunteer Registration form. Free film screening at Al Whittle Theatre. A rare glimpse into a traditional African society where music and cultural expression are some of the glue that still holds it together – Malian musician Mansa Sissoko and Canadian musicians Lewis Melville, Dave Clark, Dale Morningstar and Tannis Slimmon travel to Mansa’s home village of Baleya in the beautiful southwest hill country of Mali, West Africa. Melville is a multi-instrumentalist and a music producer, who has come to offer free recording sessions and instruments to local musicians. Sissoko is returning for the first time since leaving as a small boy; his return triggers three days of musical ritual, dancing, ceremony and celebration. After the film, please join us in a lively discussion with festival artists Tannis Slimmon and Lewis Melville. The excitement is building and you are invited to pick up the “beet” and join us for our 10th annual festival. Ten (10) years of bringing world class musicians from near and far to the stages of Acadia University, the Town of Wolfville and other venues around the valley…show your support as Deep Roots continues in its efforts to maintain the vibe in the valley. An important detail to make note of about Main Stage…you, our patrons, gave the feedback and we’ve listened. Main Stage has moved. Both Friday and Saturday Main Stage events are now at the Festival Theatre. With this smaller, more intimate venue, we fully anticipate both nights will sell out. Don’t be disappointed, get your tickets now.